Candidates to replace longtime County Supervisor Ron Roberts, who represents much of the city of San Diego, want to bolster county spending on homelessness and housing. The county will soon raid its large piggy bank to invest more in combating the region’s homelessness and housing woes if candidates vying to replace longtime County Supervisor Ron Roberts have their way. Each of the five candidates hoping to represent the district that covers much of the city of San Diego pledges to encourage future colleagues to dip into the county’s $2 billion reserve. For decades, the Republican-led County Board of Supervisors has bolstered its savings as part of a long-term strategy to address some of the county’s most looming budget challenges. They set aside hundreds of millions of dollars to bankroll new county facilities and in more recent years, to shield the budget from pension bills. Two of four longtime supervisors will be termed out this year and another two by 2020, opening the door to the increased county spending — a cause progressives have long pushed. Ex-District Attorney Bonnie Dumanis, a Republican who’s for decades rubbed elbows with long-sitting supervisors, has joined the chorus of candidates calling for more county investments in efforts to address homelessness, the region’s housing shortage as well as growing mental health and substance abuse concerns. Dumanis was the only candidate to decline an interview and instead responded to questions via email, citing a family issue. Dumanis didn’t elaborate on exactly how much she thinks should be invested in homelessness and housing needs but said the county should “right-size” its reserve account. She praised a board vote last year to direct $25 million in reserves to a fund to support affordable housing development as a good first step. She said she’d like to see the county take a stronger leadership role in addressing the region’s growing housing need and has also proposed a plan to improve local law enforcement’s response to mental illness using state millionaires’ tax money the county has been slow to spend. Dumanis’ Democratic opponents are also focused on homelessness – and they share many similar ideas. All want to see the county focus more on preventive care, mental health services, housing for homeless San Diegans and to increase public input into its budget process. Land-use attorney and neighborhood activist Omar Passons proposed using up to $100 million in county reserve funds and county-owned land for housing projects for homeless San Diegans. He believes offering up county land for housing, a prospect the county’s already working on, could help complex deals reach the finish line. He’s also suggested zoning changes and streamlining county permitting processes for middle-class housing as part of a larger housing affordability strategy. Passons is also focused on improving services for San Diego County children by better leveraging state and federal money, expanding meal and academic programming at county libraries, subsidizing transportation and expanding outreach for county benefits. “We need a system overhaul that better supports children in all aspects of the budget,” Passons said. Former state Assemblyman Nathan Fletcher has seized on Roberts’ past suggestion that the county could deploy $150 million in reserve funds for a bridge loan to help bankroll a new Chargers stadium. Fletcher has said the county should instead direct that cash to homelessness solutions and has proposed new mental health facilities, and increased affordable housing investments and rental assistance. 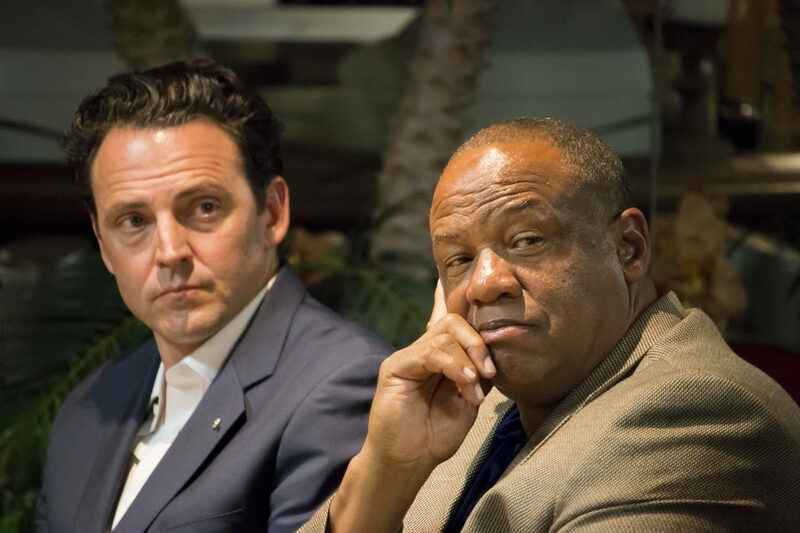 Fletcher said he would push for the county to take a more proactive approach to aiding San Diegans and to increase investment in areas, including county health staffing, drug treatment and water and air quality monitoring. “I would like to see a greater investment in touching lives than on building buildings,” Fletcher said, referring to the slew of new buildings the county has constructed over the past few decades. Former state Assemblywoman Lori Saldaña, one of the early voices speaking out about the region’s sluggish response to last year’s deadly hepatitis A outbreak, urges similar shifts though she didn’t offer specifics on dollar figures. She advocates increased county spending on mental health and preventive care, including vaccinations and food and nutrition support. She’d also like to see the county create a revolving fund to support upgrades and repairs to aging affordable housing. If elected, Saldaña said she’d also like the county to redouble its efforts to ensure county residents are aware of the services available to them and to better track the outcomes of the programs it funds. Retired deputy fire chief and Encanto planning committee chair Ken Malbrough also wants more proactive education about what the county does and what it can offer San Diegans – and a better way to evaluate outcomes. He’d like the county to focus more on gathering community input on its budget – including at night meetings that are easy for residents to attend – and to do a better job explaining its budget and reserve plans and how it’s measuring their success. “I believe when you have money like that floating, you need to have a plan,” he said. Then, Malbrough said, he’d like the county to hire an auditor to review outcomes of county programs to ensure they’re working.